We invite You to enjoy the wonderful view of the city from viewing platform of Plasku roof! 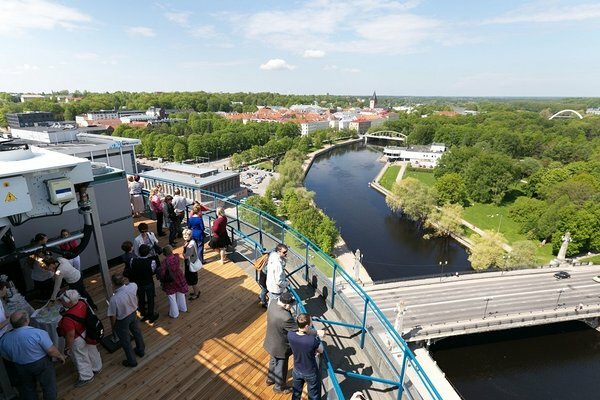 The view platform provides an excellent opportunity to see the entire city centre of Tartu from the height of 50 meters. In addition, You can admire the modern view compared to a view from a century ago and learn more about the available and destroyed buildings in Tartu. Viewing platform visits take place from Friday to Sunday, every full hour from 12 to 18. Single visit fee for Hotel Lydia's guest is 1 € (when showing the room key), children under 7 are free of charge. If you wish to visit the platform, please contact the Information desk at Tasku (Turu Street 2) and show your room key when buying the tickets.